Human Language Technology is a track in the two-year Research Master in Linguistics, specialization of the Humanities Research Master at VU Amsterdam. More details on the: Programme, Admission and Application. The VU Fellowship Programma (VUFP) for EU and non-EU students. As an international student planning to study at Vrije Universiteit Amsterdam, you can apply for a variety of grants and bursaries. Detailed information about scholarships and deadlines can be found on www.vu.nl/scholarships or www.grantfinder.nl. This is an advanced introduction to grammatical notions and theories that are used as analytical tools in applied linguistics. You will deepen knowledge of grammatical theory & of current approaches to phonology, morphology and syntax. You will be introduced to the history and philosophy of the Humanities, the VU research environment and cross-cutting themes such as Digital Humanities and Environmental Humanities. How can we connect Humanities research with societal challenges? 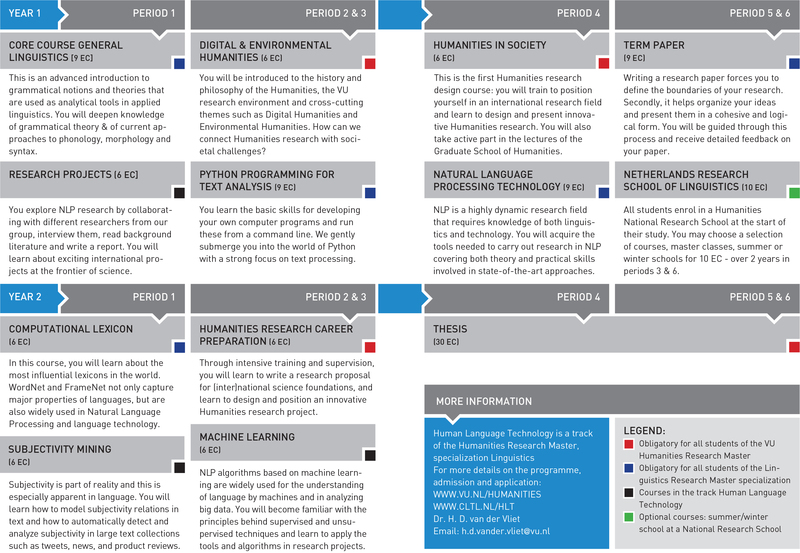 This is the first Humanities research design course: you will train to position yourself in an international research field and learn to design and present innovative Humanities research. You will also take active part in the lectures of the Graduate School of Humanities. Writing a research paper forces you to define the boundaries of your research. Secondly, it helps organize your ideas and present them in a cohesive and logical form. You will be guided through this process and receive detailed feedback on your paper. You explore NLP research by collaborating with different researchers from our group, interview them, read background literature and write a report. You will learn about exciting international projects at the frontier of science. You learn the basic skills for developing your own computer programs and run these from a command line. We gently submerge you into the world of Python with a strong focus on text processing. NLP is a highly dynamic research field that requires knowledge of both linguistics and technology. You will acquire the tools needed to carry out research in NLP covering both theory and practical skills involved in state-of-the-art approaches. All students enrol in a Humanities National Research School at the start of their study. You may choose a selection of courses, master classes, summer or winter schools for 10 EC – over 2 years in periods 3 & 6. In this course, you will learn about the most influential lexicons in the world. WordNet and FrameNet not only capture major properties of languages, but are also widely used in Natural Language Processing and language technology. Through intensive training and supervision, you will learn to write a research proposal for (inter)national science foundations, and learn to design and position an innovative Humanities research project. We offer the possibility of combining your thesis with an internship in research or at the language industry. Flyer Research Master Human Language Technology. Programme, admission and application. 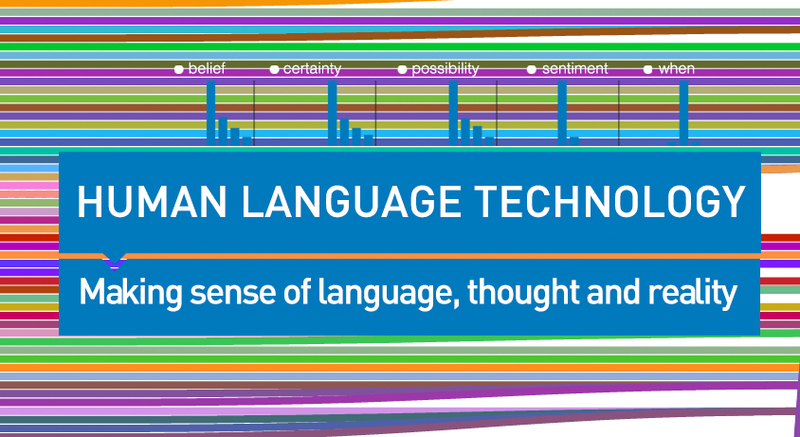 Human Language technology is a rapidly developing research field. In current Humanities research, a firm background in language technology is extremely valuable for manipulating large datasets. The Computational Lexicology and Terminology Lab (CLTL) offers a specialization in the research master Humanities in which students are trained in human language technology. A human language technology expert has knowledge of technology as used in computer applications (e.g. search engines) and of relevant linguistic theories. • The Computational Lexicology and Terminology Lab (CLTL) is one of the world’s leading research institutes in Human Language technology. • Prof. Dr. Piek Vossen, recipient of the NWO Spinoza Prize, heads the group of international researchers that are working on interdisciplinary projects, including the Spinoza project ‘Understanding Language by Machines’. You can set up your own research direction as a PhD student or you can embark on a career at a research institute. The industry provides many career opportunities, as there is a growing need for linguists with a technical background. To prepare for your career, we offer the possibility of combining your thesis with an internship in a research institute or at the language industry. • Applicants must have a Bachelor’s degree in Linguistics, Artificial Intelligence or a comparable Bachelor programme, with an average grade of minimally 7.5. • Applicants who do not meet the requirement(s) are also encouraged to apply, provided that they have a sound academic background and a demonstrated interest in and knowledge of engineering and/or linguistics. General information on the Research Master’s in Linguistics at VU Amsterdam.